There was a time when the Ohlone College softball team owned the Coast Conference. From 2002 to 2011, the Renegades of Fremont won or shared the conference title. It wasn’t until 2012 that College of San Mateo finally wrested the conference crown from them. That 2012 championship was the first five straight Coast Conference titles for CSM. 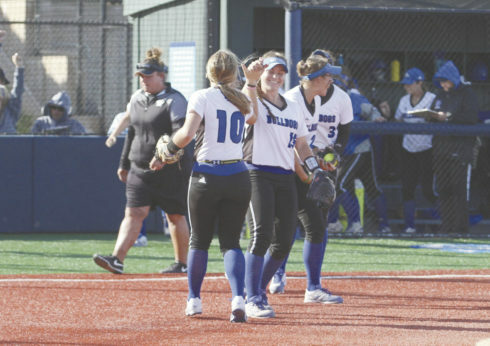 Despite a bump in the road last season that cost the Bulldogs a sixth consecutive crown, they had a chance to return to the top of the Coast Conference with a win over the rival Renegades Tuesday in San Mateo. It wasn’t easy, but CSM recaptured the conference crown with a 9-6 win over Ohlone. With both pitchers struggling to figure out the strike zone, the game turned into an offensive showcase. Ohlone hit a pair of home runs that resulted in four RBIs, while CSM scored nine runs on 14 hits. “It becomes an offensive game when the (strike) zone is smaller than you’re used to,” Borg said. “For a pitcher, it’s tough to make adjustments when you don’t know where the strike zone is. Sophomore third baseman Lauren Quirke led the CSM attack, going 3 for 4 for two RBIs and two runs scored. Sophomores Gaby Zucchiatti, MacKenzie Driscoll and Lexi Riccardi all had two hits, as did freshman infielder Aubrie Businger. Zucchiatti and Businger each had a pair of RBIs, while Riccardi and pinch hitter Kaitlyn Gretch drove in a run apiece. Not only did Quirke lead the Bulldogs’ offense, she also picked up the save in relief of starter Emily McAdams, who worked five-plus innings, giving up six runs (five earned) on five hits. Seven walks, and a three-run homer in the sixth that closed the Ohlone deficit to just three, 9-6, spelled the end for McAdams. But Quirke secured the win for her with two innings of no-hit ball. She got some help in the top of the sixth when center fielder Emily Cotla robbed Karen Didio of extra bases but, in the top of the seventh, Quirke struck out the first two batters before inducing an infield popup to end the game. Quirke, a 2016 Hillsdale graduate, maybe pitched 18 innings during her entire high school career — including club play — Borg said. But the CSM coach, who pitched at the University of Tennessee, saw potential in Quirke last season and, after a year of working on her craft, Quirke became a major key to the staff this season. “The joke around here is, ‘Don’t joke around with me,’” Borg said, adding Quirke dropped an off-handed comment last season about pitching. McAdams started the game innocently enough, getting a strikeout and groundout to start the game. But Ohlone’s Lauryn Garcia put a charge into a 2-1 pitch and sent it over the center field wall for a 1-0 Renegades lead in the first inning. This entry was posted on Wednesday, April 25th, 2018 and is filed under Athletics, Headline, Softball. You can follow any responses to this entry through RSS 2.0. You can leave a response, or trackback from your own site.